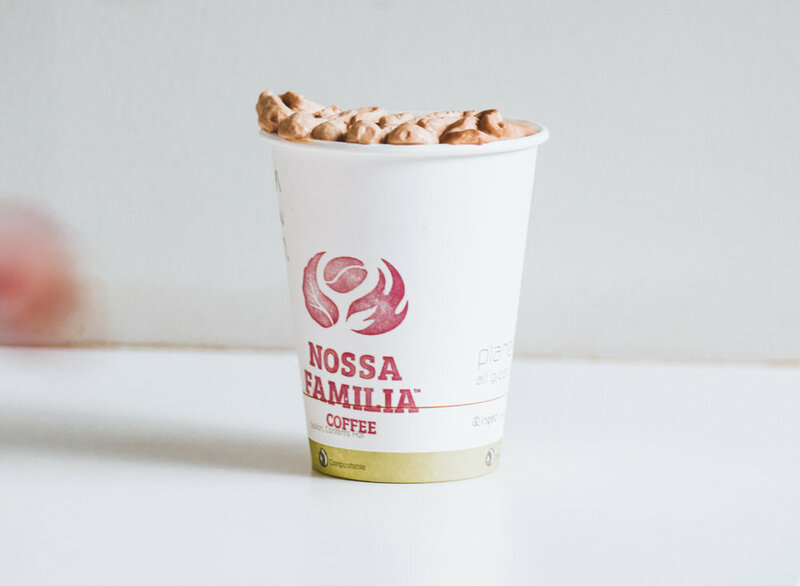 A mocha with whipped cream served in a Nossa Familia Coffee compostable paper cup - now 25 more cents at the Seven Corners Café. In our previous post in the Sustainability in the Café Blog Series, we dove into what it means exactly to be a Zero Waste coffee shop, which is a goal we set when we opened our newest Seven Corners Café in Portland last summer. One of the major changes we’ve made in this café was a step to limit the use of disposable cups, and also to account for their negative environmental footprint. We decided to implement a to-go cup upcharge: an additional 25 cents charged when a customer orders their drink in a disposable cup. To be clear, this is really a baby step toward Zero Waste, where the end goal would be to eliminate disposables entirely! We weren’t quite ready to completely go cold turkey on the paper cup, something so many of our customers rely on, so we chose to first bring more awareness to the idea that a paper cup is not a necessity. Why the To-Go Cup Upcharge? To be clear, the charge for cups is not about the money. It’s about the cup. It’s about being less wasteful and taking care of our city and our planet by reusing more and using less. We don’t profit from the upcharge, instead we’ve set out to use the funds generated to offset the environmental footprint of our own and our customers’ behaviors. We are currently working on our carbon footprint assessment to achieve CarbonNeutral Certification. Some might ask, why not just offer a discount to positively encourage customers to bring their own cup? Well, we do! We have been offering 25 cents off for customers who bring their own cup ever since our first Espresso Bar opened back in 2013. While we have found that many of our customers are particularly environmentally-conscious, this discount has not really seemed to be an influencing factor on customer decisions and behaviors. It has acted as more of a bonus for people who would do so anyway, instead of significantly impacting behavior change. We still offer this discount at the Seven Corners Café, because it is a great practice to bring your own cup, and it does save us some additional expenses from needing to use and wash our café cups. Are the cup usage behaviors of Seven Corners customers different from those at our other Portland cafés? We used transaction data from our point of sale systems at all three of our Portland cafés to get to the bottom of this question. We compared Seven Corners cup usage data on for-here, to-go, and own-cup orders to our other two cafés, the Pearl District Espresso Bar and our Central Eastside Café. These results were stunning, and significant. As shown in the chart, 52% of our Central Eastside and 80% of our Pearl District customers get their drinks to-go, where a disposable cup is complimentary. Less than half get their drinks for here. By contrast, at the Seven Corners café, where a to-go cup will cost you an extra 25 cents, only 31% of customers get their drinks to-go. That’s less than half of the share of customers using a disposable cup, on average, compared to our other two cafés! We’re also seeing a big jump in customers choosing to bring their own cup at Seven Corners. When it comes to BYOC, at Central Eastside, 5% of customers bring their own to get the 25-cent discount, and 8% of customers in the Pearl District. Compared to 1-2% of Starbucks customers, we’re doing really well here! But check out Seven Corners, where we have the to-go cup upcharge: 17% of customers - more than triple that of Central Eastside and double the Pearl District - are choosing to bring their own. This is a stunning factor, when all three cafés are offering the same discount for bringing your own cup. This makes us ask: why the big jump? Our hypothesis is that it has to do with the culture and ethos of the Seven Corners cafe, where bringing your own is really celebrated for its environmental benefit, and our customers want to be a positive part of our Zero Waste initiative. The idea of default choice is that the default option is status quo. It’s what happens when someone does nothing. In coffee shop world, it’s getting a to-go cup free with your drink--that’s just how it’s done! But why? What if we make the default option less wasteful - getting it “for here.” If the customer does nothing, they get their drink in a reusable cup to enjoy in the cafe. They can always pour drink into a to go cup if needed, but once it’s in a paper cup there’s no going back. On top of that, other studies have shown that one of the strongest ways to influence consumer behaviors is by implementing price signals, i.e. extra charges, to discourage negative behaviors. People are more likely to evaluate and modify their choices when they are confronted with needing to pay more for them. They are more likely to seek out alternatives where they could pay less, such as bringing their own cup or getting their drink for here. In the current cafe environment generally, customers simply are not paying the true cost of the disposable cups. Those costs are instead borne by the environment, the coffee business, and local taxpayers funding municipal waste disposal systems. Consumer-based price signals like the to-go cup upcharge can significantly influence purchasing behavior, while offsetting the negative externalities that arise from the consumption of these products. Additionally, recent environmentally-driven policies in other areas have shown that strategically pricing a formerly free resource can encourage lower consumption and also help defray the costs of their externalities. This has been seen with recent moves toward implementing taxes on plastic bags, traffic congestion charging in large cities, and pay-as-you-throw garbage schemes. It’s the basic principle that the “polluter pays,” and we think it’s a good one to get behind! The data from our point-of-sale system at Seven Corners is very clear about which drinks are purchased with which kind of cup: when a customer brings their own, they get that discount; when they need a to-go cup, they incur that additional charge; and when they get their drink for here there is neither a discount not an extra charge. We wanted to compare this data to our other Portland cafés to get a baseline for what actions were being taken. Since we don’t normally track data on for-here and to-go at the other cafes, we asked our baristas to record this data for a few weeks, and took a week-long snapshot of data from this period to make comparisons. The recording of each transaction was not at 100%, however we were able to extrapolate from the data we were able to collect to each of these estimates. Oatmeal jars with fruit & nuts available at Nossa Familia’s Seven Corners Café, sold with a refundable deposit for the mason jar it comes in. Nudge, by Richard Thaler & Cass Sunstein, 2009. “Signaling Change: Studying the effect of price signals on disposable hot beverage consumption,” by Laur Fisher, 2008.